Woo-Hoo!! Time to celebrate 30 weeks without dye! Ladies, if you can be patient and get through the first months, it is worth it, believe me! 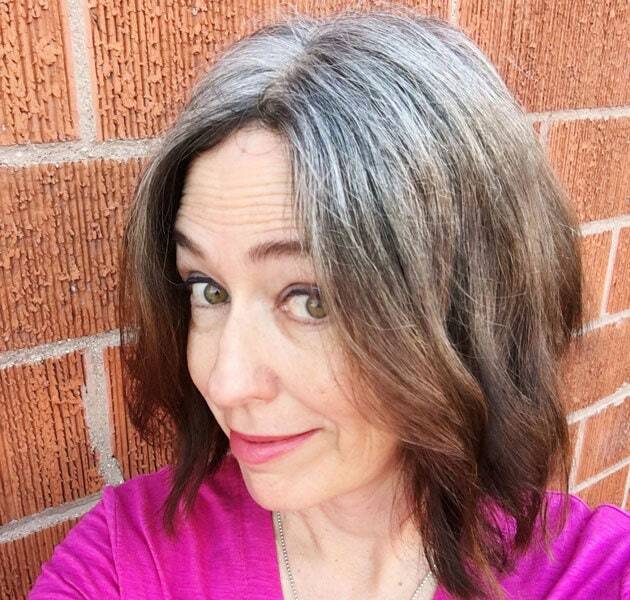 My favorite thing about making it to 7 months is that my dye has faded considerably and so the dyed parts of my hair are blending better with the gray roots, as you can see below. What a relief! I’m losing SO little hair! I used to leave clumps of hair in the shower in the morning. It was gross. We had to buy a special little strainer for our shower (a hair trap) and it was ONLY for me! Now, we could probably get rid of the strainer as whatever I am losing is negligible. I’m growing new hair! I’ve lost some hair due to the heavy stress I’ve been under the past few years. Unfortunately, the stress isn’t totally gone, but my hair does seem to be growing back. 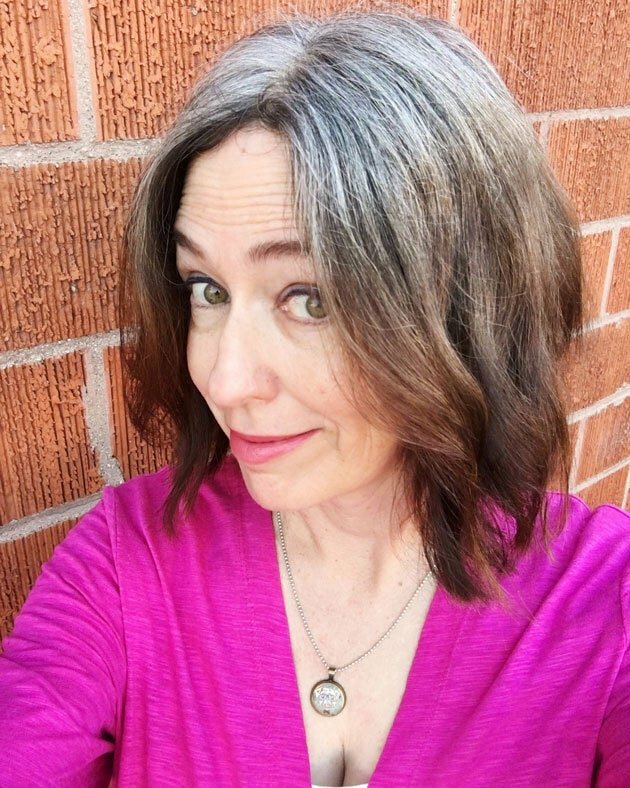 I haven’t done anything differently EXCEPT stopping the dye, so I do have to wonder if that is the reason my hair is growing back. 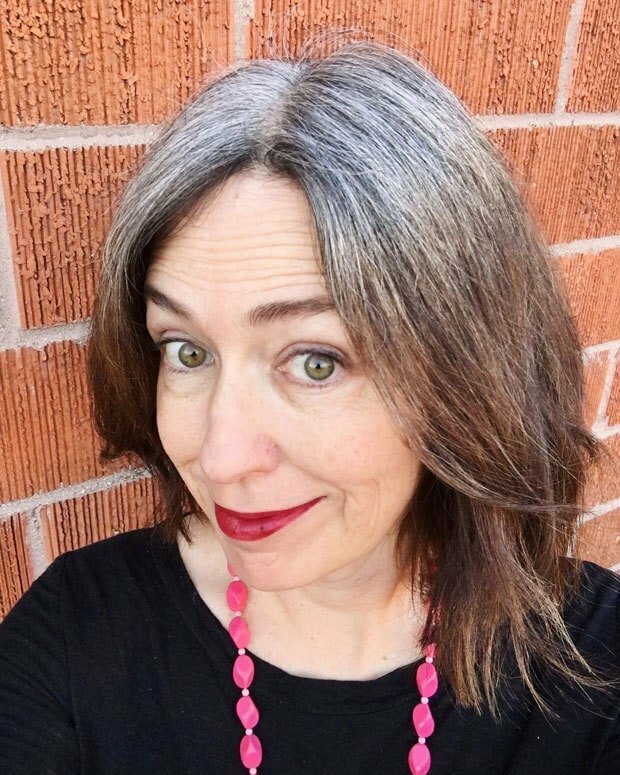 My silver hair is soft, shiny and manageable, not the coarse, wiry mess about which we’ve been warned all these years. That has GOT to be a myth spread by the hair color conglomerates. 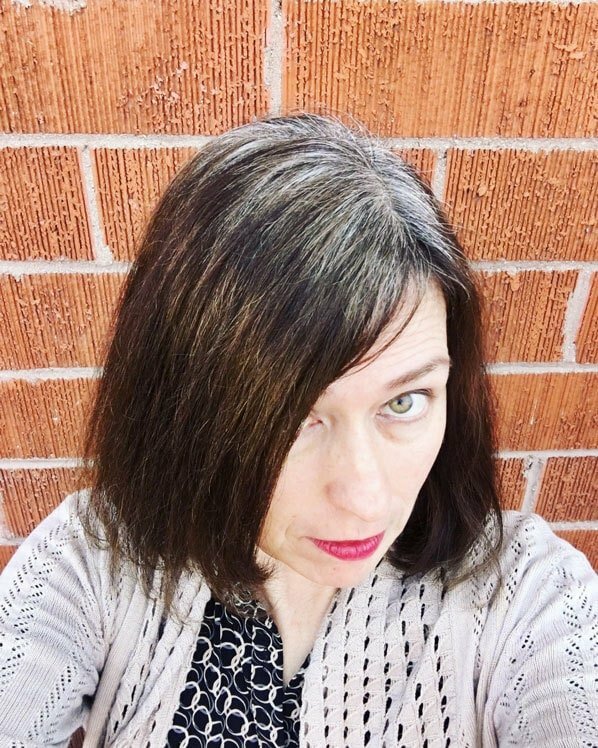 I ordered Overtone Extreme Silver Deep Conditioner, as I am really curious to try it now that my dyed hair has faded so much (it doesn’t work well on dark hair, they told me). The first package got lost in the mail, but Overtone is sending me a replacement. I’m on tenterhooks as I am dying to try it! Just really, really curious to see how it compares to the Joico Blue Shampoo that I love so much. It repeats some of what I wrote above, but at least you can see my hair color in action. Ignore the deep circles under my eyes – I’m really fighting insomnia these days. My blog started in early July 2018. So far, I’ve had 6200 visitors and 18,500 page views. Not too shabby! Thank you all for your support and the kind comments you send me! 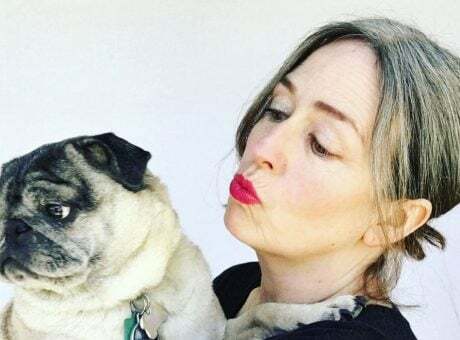 I feel that the gray hair movement is growing every day, which really gives me hope that the younger generation of women may not feel the need to color their beautiful silvers and that gray will stop being only associated with old age. I loved how you summed up at the end, ‘the long goodbye’. I feel the same, I never wanted to dye to a different colour, just keep to dark brunette , it was/is my identity too. It’s going to take the whole transition time to ‘say goodbye’ and become friends with my new silver. Keep up the great work. 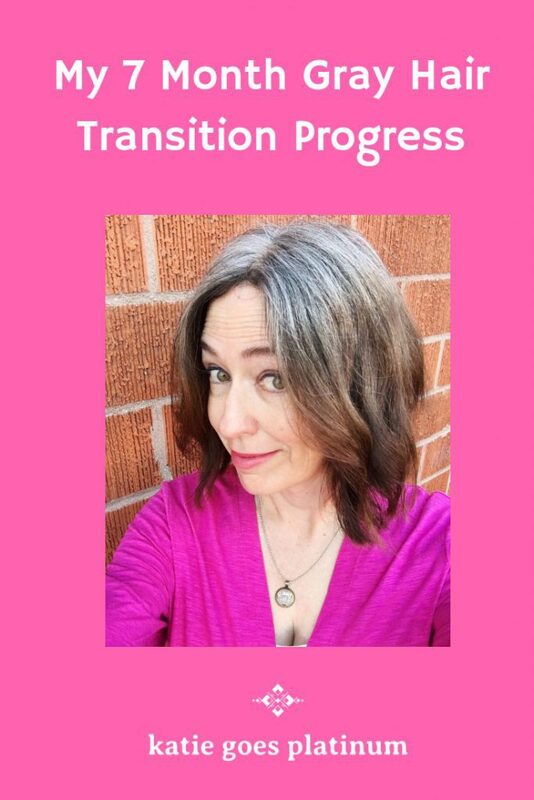 Love seeing all the pictures of the transition. Keep them coming! Love all that you share Katie. It’s made this journey so much easier knowing (1) I’m not alone and (2) seeing what I have to look forward to. Even though all of our silvers are different, we are still united.